I've returned from another inspiring trip to the East Coast and am hoping to conjure some of the elemental experience of sea, sky, and land in some new compositions. At the same time, I'm continuing to take a portraitist's approach to the wildlife that seems as archetypal as the landscape. 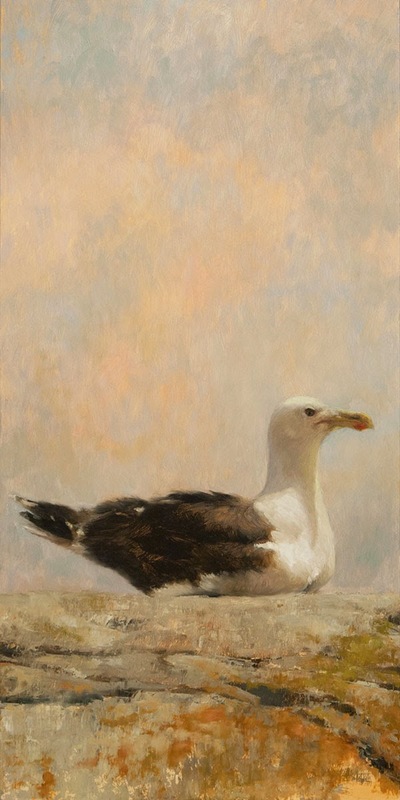 Solitary Great Black-backed Gull, oil on panel, 12" x 24"
While gulls, genus Larus, are found almost everywhere in the world, I associate the Great Black Backed gull, Larus marinus, the largest gull in the world, with my trips to the Nova Scotian coast. For all of its imposing size, this a shy bird, and never allows me to come very close however stealthily I paddle my kayak. It seems to sense, with a predators keen eye, when it is being looked at with intent and abhors my paparazzo efforts. Really love this painting Shannon! I hope we can see it first and maybe put a red dot on it. This painting is destined to be part of a November exhibition for the 20th anniversary of F.L.A.P. (Fatal Light Awareness Program) which is aimed at reducing the number of migrating bird deaths caused by window collisions. A percentage of proceeds from the sale of the paintings will go to support the continuation of the program. We should talk about whether, how, where.